Lovely 2 bedroom 1.5 bath townhome in desirable Twin Ridge Condominiums. 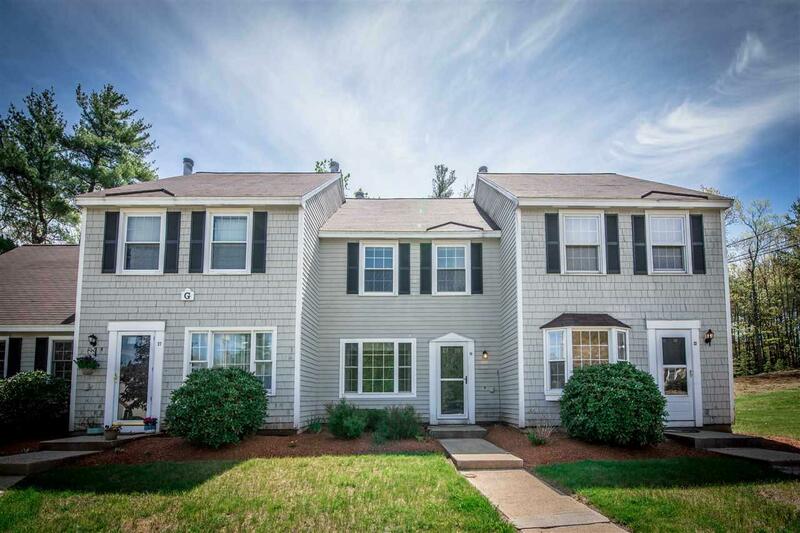 Country setting yet so close to NH shopping & highway with low condo fee & pets allowed. Many upgrades including new stainless steel appliances, vinyl tilt-in replacement windows, new high efficiency HTP Pioneer Gas Heating/Water heater combo, new tub surround, 2 year new roof. Enjoy a cozy crackling fire in the living room w/ pergo wood floors & picture window for lots of light. Bright white Kitchen with tile floor opens to living room & dining area, 1st floor half bath & 1st floor laundry. Back door off kitchen opens to deck with serene forest view & rock outcroppings. Master Bedroom with double closets, ceiling fan and entry to full bath. 2nd bedroom also boasts double closets & ceiling fan. Many closets throughout the home for great storage as well as an outdoor storage closet off of the deck. Pets allowed not to exceed 45lbs. Recent electrical inspection 4/29/17 - electrical all in safe working order & without code violations, see receipt. 2 deeded marked #26 parking spots in front of unit. Showings begin Sunday 5/21/17. Portions Copyright © 2019 Diane Beekler. Portions Copyright © 2001-2019 iMaxWebSolutions.com.